My guest on this episode of the podcast is Coventry born and London based printmaker, Paul Catherall. After training in illustration Paul found himself working from project to project until one came along that asked him to produce work that he recognised from early British Rail posters. Coupled with a trip to San Francisco where he found further inspiration, he pursued a stripped back poster style of design, with flat colours and developed it using linocuts. It is a style and process that he has not strayed from despite experimenting with other print techniques over the last twenty years. As a jobbing illustrator he was working from project to project until he was offered as assignment by Gleneagles Hotel which then became the starting point of developing his own style and the one he is now known for. The approval of friends in the graphic design industry - which in the late 90s was becoming more computer based - spurred him on to keep working at what was then considered a very manual process and one very out of fashion, as the world around started to digital..
He’s been commissioned by various publishers to design book covers and dust jackets but he is still able to sell those artworks as prints from his online shop or through the galleries he works with. He likes to run his own exhibitions, hiring out the Oxo Tower Gallery every few years. He enjoys the control of organising his own exhibitions and producing sufficient work to fill the large space. And he admits that if anything goes wrong then it’s all on him as there is no team. Hayward I. Limited edition of 50 produced in 2010. Oxo Red III, a print from 2011. The Oxo Tower has a gallery at the ground floor which has also been the venue for Pauls’ solo exhibitions, most recently in summer 2018. Tate Power Pink. Paul talks about colours of buildings in the conversation, and associating the Tate Modern with pinks that he sees in the bricks. Another of the buildings on the South Bank. 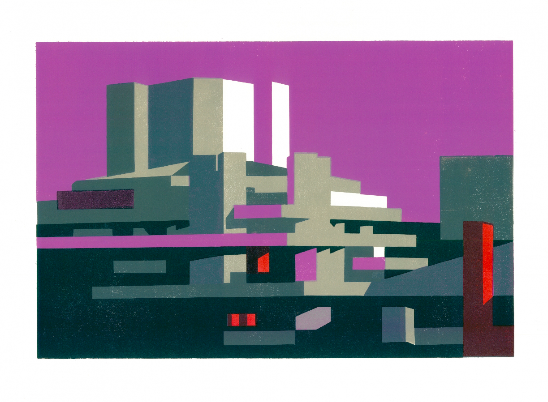 This time the Royal Festival Hall is given a sunny disposition in this print titled Festival II, a limited edition of 50.